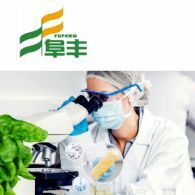 The world&apos;s largest monosodium glutamate and xanthan gum producer and a major supplier for a series of bio-fermentation products, Fufeng Group Limited (HKG:0546) and Evonik entered into a cooperation agreement for the production of ThreAMINO(R) (L-Threonine). 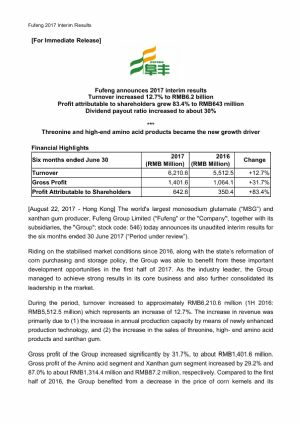 The world&apos;s largest monosodium glutamate ("MSG") and xanthan gum producer, Fufeng Group Limited (HKG:0546) (OTCMKTS:FFNGY) today announces its audited annual results for the year ended 31 December 2016. The world&apos;s largest monosodium glutamate ("MSG") and xanthan gum producer, Fufeng Group Limited (HKG:0546) (OTCMKTS:FFNGY) ("Fufeng" or the "Company", together with its subsidiaries, the "Group") today announces its unaudited interim results for the six months ended 30 June 2016 ("Period under review"). 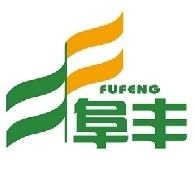 The world&apos;s largest monosodium glutamate and xanthan gum producer, Fufeng Group Limited (HKG:0546) (OTCMKTS:FFNGY) today announces that Mr. Li Xuechun, the controlling shareholder and Chairman of Fufeng, purchased 3.094 million shares of Fufeng. 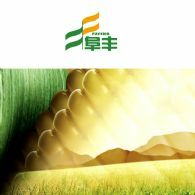 The world&apos;s largest monosodium glutamate and xanthan gum producer, Fufeng Group Limited (HKG:0546) (OTCMKTS:FFNGY) today announces its audited annual results for the year ended 31 December 2015. 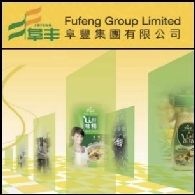 The world&apos;s largest monosodium glutamate ("MSG") and xanthan gum producer, Fufeng Group Limited (HKG:0546) (OTCMKTS:FFNGY) today announces its unaudited interim results for the six months ended 30 June 2015. Benefiting from the completion of MSG industry consolidation, profitability of MSG business further strengthened High-end amino acid and specialty ingredients business became the new growth driver. For the new Baoji Plant, the Group entered into a framework investment agreement with Caijiapo Economic and Technological Development Zone Management Committee of Shaanxi Province with a plan to relocate the new plant. The Group is actively preparing for the relocation of its new Baoji Plant. 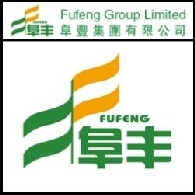 The world&apos;s largest monosodium glutamate and xanthan gum producer, Fufeng Group Limited (HKG:0546) today announces its unaudited interim results for the six months ended 30 June 2014.